Houghton is a 150 year old global company. 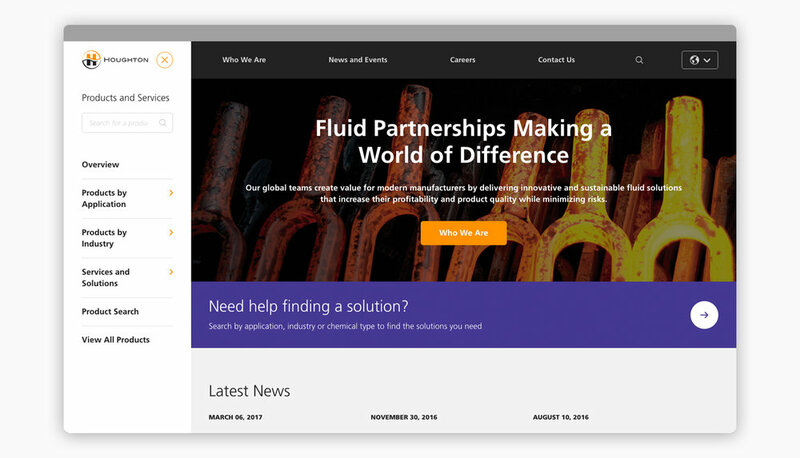 They develop cutting edge fluids for the manufacturing industry. I directed the user experience and design teams working on the relaunch of their multi-lingual, responsive website. Leveraging a visual exploration exercise with the Houghton stakeholders, we identified an initial concept, tone, and color/imagery application preferences for a design approach. This helped align thinking on design as a group upfront. Once discussions around the visual exploration were complete, we designed a style tile board based on feedback. We presented the board to the Houghton team and discussed. This step helped to illustrate how design choices materialize in a visual way. It also introduced the concept of a component design system for the site. Meanwhile, the UX team worked with the stakeholders on an updated sitemap and IA. There was a big push to highlight their product line, so that was given primary focus in the approach. 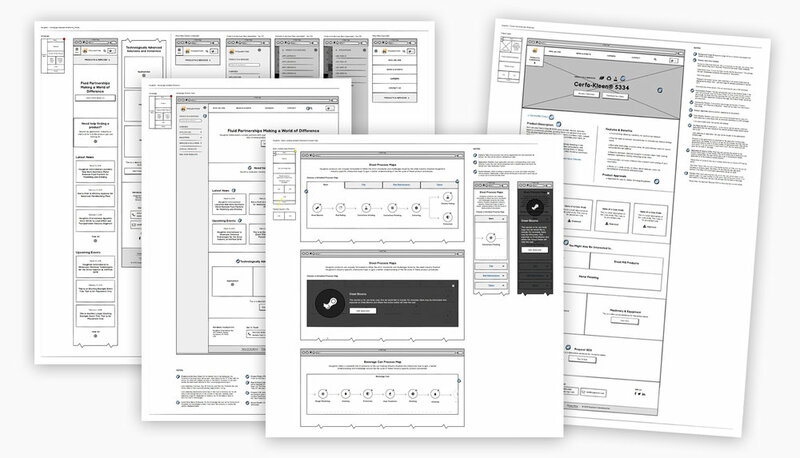 We produced various detailed wireframes which covered each screen template (including expected interactions). I encouraged the designers to add notes when and where appropriate. At this point, I had UX and visual design converge thinking to fully establish the look and feel of the site. We assembled everything and presented to the Houghton stakeholder team. We received an overwhelmingly positive response to the design and only needed to adjust some minor elements after review – A testament to sharing the creative journey with the stakeholders. How multiple languages would render in the design was a consideration from the start. We prototyped areas of the site and tested various languages along the way. Once the initial sample design screens were approved, we built a full component library for desktop and mobile screens. We were already moving quickly with front-end development and final approvals on design occurred in the browser. The client was very happy overall with the project. The approach to isolate the product navigation as a global element was particularly effective for how users want to interact with the experience. At times, projects come along that cause you to re-evaluate and improve your communication processes. My development counterpart and I took shortcomings identified in our existing process as an opportunity to better formalize our QA framework.